The thing about skincare, which I’ve said before and will say again, is that there’s nothing universal about it and there’s nothing truly objective about it, either. A product that works amazingly well for 90% of people may work really poorly or not at all for the other 10% (and that’s not the product’s fault, nor the fault of either the people who love it or the people who don’t). YMMV! With that being said, how are we supposed to identify products that we might like, if not by looking at the recommendations of others? That’s, like, the whole point of this blog. The thing is that even when someone else’s recommendations get us excited, we’ve got to remember that there are no guarantees. Even I sometimes get a product because of someone else’s recommendation and end up disappointed. It’s inevitable, especially given the number of new products I try. This review is about one of those disappointing times. Yes, placenta. We’ll talk more about that later. Purpose: Mizon Original Skin Energy Placenta 45 Ampoule is a serum-type product that claims to improve wrinkles and brighten skin tone. Do not use if: You are squicked out by animal-derived ingredients like placenta, sensitive to niacinamide, or react negatively to alcohol, glycols, or anything else in the ingredients list. When and how to use: After cleanser, actives, and/or toner, and before any heavy-textured serums or ampoules, dispense a generous amount of product onto your palm and smooth over face. Pat in or let dry, then proceed with the rest of your routine. The only ingredient flagged by CosDNA analysis was butylene glycol, which scores a 1 as a potential acne trigger. Notable ingredients: Okay, I guess we better talk about the placenta thing. The placenta used to make the Mizon Original Skin Energy Placenta 45 is mammalian placenta, though I couldn’t find any information on which mammal specifically contributed its afterbirth to this product. I have a pretty strong stomach for ingredients like this, so it didn’t put me off. (I’m currently using a donkey milk cream, so.) It helps that since placentas are expelled by the animal after giving birth, presumably gathering the placentas doesn’t involve harm or undue stress to the animal. But does placenta do anything for skin? There isn’t much research behind it, as might be expected. My personal take on it is this: Placenta extract is a lot like snail mucin, starfish extract, donkey milk, propolis, or other “star” or “trend” ingredient. In itself, I doubt it has some magical property. What may be useful about it is that it is a compound of many beneficial components–in the case of placenta, various proteins, enzymes, vitamins, and other nutrients with the potential to benefit skin. So it isn’t the next retinol, but it may not be useless, either. With that being said, I got this product with much higher hopes for the niacinamide and the adenosine (which appears in the middle of the list here rather than at the end, as it so often does, though that may not mean much) than for the placental protein extract. I first learned about Mizon’s Original Skin Energy Placenta 45 Ampoule on Reddit, where a fellow /r/AsianBeauty user mentioned that it had done a great job of smoothing out some fine lines on her forehead and that it had also helped fade some of her dark spots. I was already positively biased towards Mizon, whose snail products I’ve used extensively and really enjoyed, so I picked this ampoule up for cheap on RoseRoseShop and gave it a go. With serum and ampoule products that claim to have significant active effects on skin, I always use them for at least 4 weeks before making a final judgment. 28 days is approximately the amount of time it takes for skin to fully renew itself, so it’s a good timeframe for assessing the results a product can provide. As it happens, 28 days was just about enough time for me to finish off the bottle, too. 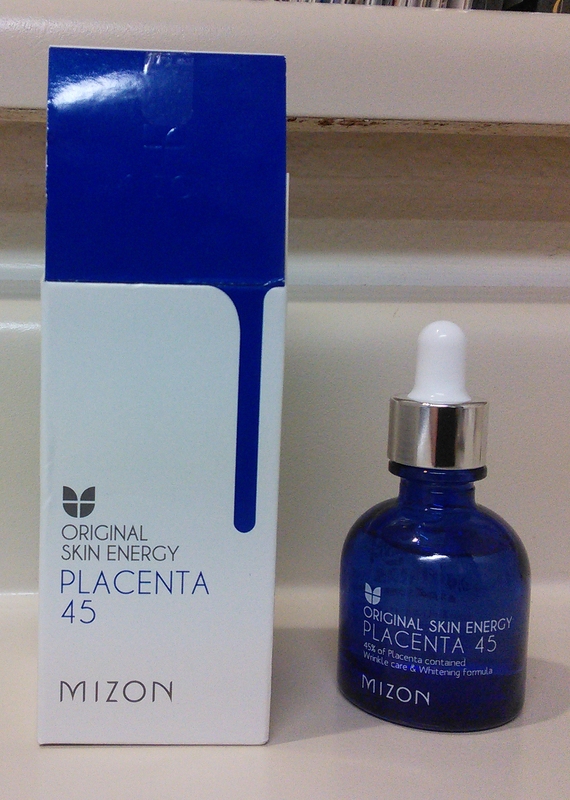 Mizon Original Skin Energy Placenta 45 Ampoule is surprisingly thin and watery. I’d expected a thicker and more viscous texture, something more like their Snail Repair Intensive Ampoule, but this product is actually a bit thinner even than many hydrating essences. On the plus side, this makes it ideal for hot or humid weather. It sinks in very quickly and leaves no residue behind to make skin feel weighed down or suffocated. On the other hand, however, I actually found that this product sinks in too quickly. I had a hard time managing to get a normal-sized amount over my face without it all absorbing into the first part I touched before I could spread it over the rest of my skin. It also has very little slip, making spreading it out even more challenging. As far as immediate effects go, Mizon Original Skin Energy Placenta 45 Ampoule is moderately hydrating. I saved the empty bottle for the purposes of doing a review and found a tiny dribble left inside, just enough to use on a bare face and test with my new digital skin analyzer. According to my test, Mizon Original Skin Energy Placenta 45 Ampoule increased my skin’s hydration by about 6%. That’s significantly less than a dedicated hydrating toner or hydrator like the ones in my current skincare wardrobe contribute, but on par with other serums and with my COSRX acids. It’s a decent boost of hydration if your routine lacks hydrators, but nothing to write home about. And as far as long-term brightening or smoothing effects go? Nada, at least for me. My skin improvements tend to take a slow but steady pace due to my regular and consistent use of real actives like vitamin C and AHA, and I didn’t notice any acceleration in brightening or wrinkle reduction during the month that I used this product, and when it ran out, I didn’t miss it at all. That makes me suspect that although niacinamide is near the top of this ingredients list, its concentration in the product is actually rather low. Disappointing. The Walker gets away while Rick and Daryl discuss their disappointment with Mizon Original Skin Energy Placenta 45 Ampoule. Conclusion: I’m disappointed all around by Mizon Original Skin Energy Placenta 45 Ampoule. While it produced no negative effects on my skin, it didn’t deliver any positive effects, either. Ultimately, it isn’t worth trying unless you just want an additional hydrating layer in your routine, and if you just want an additional hydrating layer in your routine, there are far more effective and economical options out there than this. This has been incredible for reducing my PIH, redness and facial scars, but mine has a different ingredient list. Placenta is the first followed by niacinamide and there’s no alcohol. It’s slightly thick, not really watery either. I really hope the formula hasn’t changed! Oh interesting! Yeah, I’d like to do a second chance review once in a while, so I may look into that, thank you! does it have no scent? Not that I could tell! where can buy this here in korea..?